WASHINGTON — When historians look back on the Trump years, they will wonder why the president of the United States cozied up to some of the most authoritarian, controversial and brutal leaders in the world. 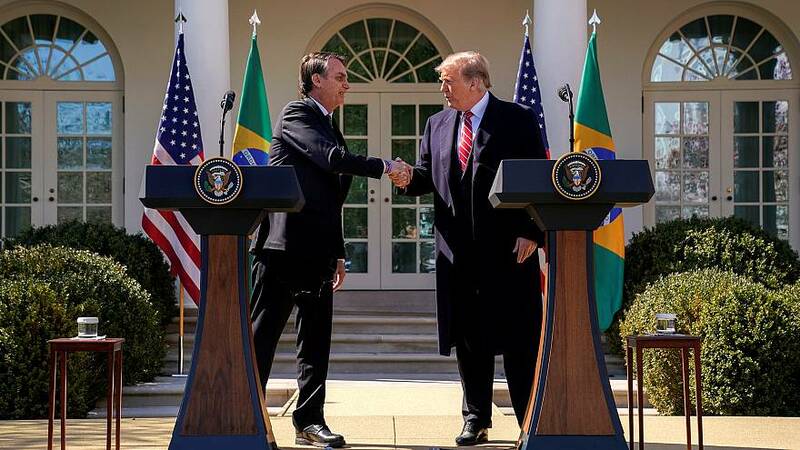 On Tuesday, Trump held a joint press conference with Brazil President Jair Bolsonaro, who has been accused of making homophobic, misogynistic and anti-gay statements. And the two men looked and sounded like BFFs. "May I say that Brazil and the United States stand side by side in their efforts to ensure liberties and respect to traditional family lifestyles, respect to God, our Creator, against the gender ideology or the politically correct attitudes, and against Fake News," Bolsonaro said at the news conference. "I'm very proud to hear the president use the term 'Fake News,'" Trump said later during the presser. Last month, Trump came to Kim Jong Un's defense over the death of American Otto Warmbier, saying: "I don't believe that he would've allowed that to happen." Back in 2017, Trump praised the Philippine President Rodrigo Duterte for combating illegal drugs. Duterte's method: extrajudicial killings. The Trump administration has rolled out the red carpet for Saudi Arabia's Mohammed bin Salman, who has authorized a campaign against dissenters, one of whom was Jamal Khashoggi. Oh, and there's Vladimir Putin. Make no mistake: Team Trump also has picked fights with some unsavory regimes and countries, like Venezuela and Iran. But the United States loses moral authority when it rubs shoulders with Putin, Duterte, Kim Jong Un and Bolsonaro. Maybe the biggest surprise of all is how normal — by the GOP, by the press — these cozy relations have started to become. But none of it is normal. The Democratic Super PAC Priorities USA is up with a six-figure digital buy in Florida, Michigan, Pennsylvania and Wisconsin that goes after Trump for doing harm to his own base, NBC's Ben Kamisar writes. "In Trump's America, the billionaires win," one of these ads states, with testimonials from voters. "We get screwed." In 2016, the Clinton campaign attacked Trump for being unfit for office. But in 2019-2020, Democrats are using the Romney playbook against him — for screwing the little guy. Chew on this: While the first two Democratic debates will have space for up to 20 candidates (on back-to-back nights), the debates in the fall and winter of 2019 could have room for just 10. We have a good idea who six of these 10 might be: Biden (if he indeed runs), Bernie, Beto, Kamala Harris, Elizabeth Warren and (probably) Amy Klobuchar. On the campaign trail today: Kirsten Gillibrand spends her day in Iowa, hitting Muscatine, Burlington, Ottumwa and Des Moines… And Beto O'Rourke makes a swing through New Hampshire, stopping in Claremont, Plymouth, Conway and Durham. That's the share of Democratic voters and Democratic-leaning independents in a new CNN/SSRS poll who said that the party has a better chance of winning in 2020 if Joe Biden is the nominee, compared to 36 percent who said someone other than Biden would give them a better chance of victory. The script is flipped when the same voters were asked about Bernie Sanders. Just a third (33 percent) said Democrats would have a better chance of winning with Bernie Sanders as the nominee, compared to 56 percent who said someone else would fare better. The two questions together boil down how the party is wrestling with questions of electability and progressive purity for its two (current) frontrunners for the nod. But it's also worth noting that a majority of Democrats — 59 percent — also said it's too early to say which candidates they may support in the end. Another 37 percent said there are one or two candidates they're already supporting to win. Don't miss the pod from yesterday, when we looked at a new question that Democrats are addressing on the campaign trail: Should the Electoral College stay or go? Benjy Sarlin and Alex Seitz-Wald have a smart take this morning on how campaigns themselves have become the message for Democrats in 2020. Even after Amendment 4, Florida Republicans voted to limit the number of former felons who can vote. The Wall Street Journal reports that Biden is starting to call around to supporters to clue them in on his plans. And world leaders have been pushing Biden to get in, POLITICO writes. Here's Jonathan Allen on Trump's continued attacks on John McCain. Is Trump turning on Fox News? Hmmm.. Rod Rosenstein is staying at DOJ "a little longer." Preet Bharara says he considered taping a call with Trump. The special counsel is seeking a delay in responding to a request from the Washington Post about sealed records in the Manafort case. Bibi Netanyahu and Donald Trump seem to have more and more in common these days. Candidates have their eye on the 65,000 small donor prize. Both Bernie Sanders and Elizabeth Warren are struggling with black voters. Donald Trump's campaign is keeping its focus on Ohio. Beto O'Rourke is calling voter ID laws "racist." Beto's strategy is stepping on Amy Klobuchar's style.